Neal Bawa is the President and COO of Financial Attunement, a commercial real estate investment company that specializes in acquiring apartment complexes across the US for over 200 investors. Neal is an accomplished single family and multifamily investor. He currently owns single families, duplexes, triplexes and quad-plexes in CA and IL. He is an active and passive investor in multifamily and commercial syndications (over 2,000 units) in 8 different states. Brett: Man, all I really want to do is I wish I could just analyze everything I can in the City of Indianapolis. Brian: There is apps for that. Brian: What do you want to be able to do? What do you want to be able to analyze? Brett: I wish I would be able to like analyze the rents and just everything. It would be super cool. Brian: There is an app for that. Brett:What if I wanted to turn myself into a monkey? Brett: What if I wanted a cheeseburger to come out of my camera right now? Brian: There is literally an app for that. If there is an app, whatever you want to do, I guarantee that our guest today has an app for whatever you want to do. Brett: Dude, I got to listen to Neal Bawa. This is the episode 100 in the hizzy on the Simple Wholesaling podcast. Welcome to Simple Wholesaling. A Christian podcast that supplies simple, yet effective content for real estate investors and business entrepreneurs. Get advice, tips, and tricks so that you can stay true to your values and achieve your dreams with real estate investing you can trust. Now, introducing your host, Brett Snodgrass. Brett: What is up all you Simple Wholesaling fans out there? 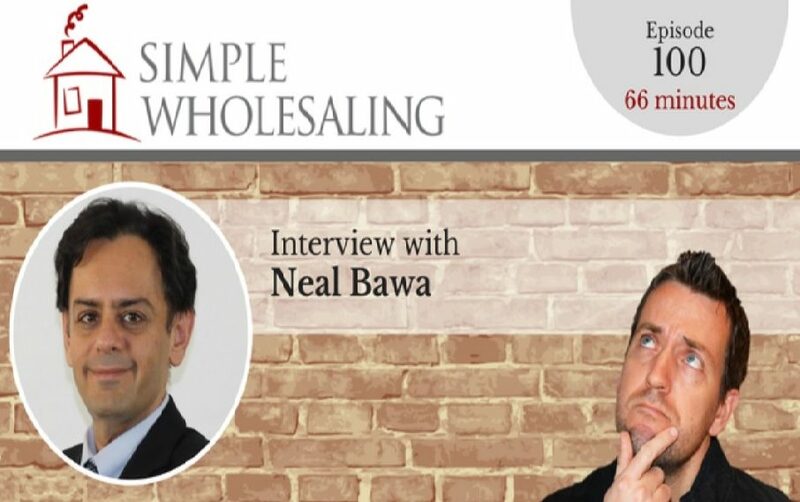 Thank you for joining us again on another episode of the Simple Wholesaling podcast. My name is Brett Snodgrass and I am with my lovely co-host, Brian Snider. Brian: I love how you introduced me as lovely. Brian: Makes me feel special. Brett: I do. I really introduced you as the bearded woman or the lovely princess the next. No man, how is it going? Brian: It is going well. It really I want to check in with you because this is episode 100. Brett: I cannot believe it. Brian: Four for me but 100 for you. Brian: Do you feel like you know a little bit about what you are doing now? Brett: I do. If you are a first time listener, go back and listen to episode number one and see and just kind of put a comment in the show notes at simplewholesaling.com/episode100 or go leave or review. See if we have gotten better. I do not know, let us let the audience participate. But I was super excited. It is almost like I kind of forgot this was episode 100. It has been a blur. I cannot even believe we have been doing this almost two years and it has just been crazy. Brian: It is really exciting like for the show and for the business to have a hundred shows. I feel like we are still going strong. Brett: Yes. We have just touched the tip of the iceberg people so stay tuned. We have some crazy stuff especially if you want your mind absolutely wowed. If you are going to a magician show or you are going to a circus, this interview is not even comparable to that. It is so much better because we interview a gentleman named Neal Bawa and he blows my mind with how much wisdom the he has in his systems, and his processes, and he has created an app or he knows different apps that will blow your mind and give you so much information and make your life so much easier. Brian: This is absolutely… You guys had some phenomenal guest on here but this is literally one that I just kind of sat there and I did not know what to say because I just wanted to keep listening to him. Brian: It is so much knowledge about this stuff. Brett: Especially when he starts to go into… He has 40 different apps that can really help you improve your processes, your systems and your business and he gives just a little taste, a few apps that can literally change your business. I always believe that if you can just get one nugget, one app, one process, one system, one software, to help you move the needle so much further along. It will change everything for you and I feel like that this is what Neal does today. Stay tuned for that. But before we go into that, man let us talk about you. This is your fourth this is my hundredth but how are you doing? How is the role going? How is the fam? What is your feelings on everything going so far with the Simple Wholesaling team the last five months? Brian: Well, first of all, I love our team. Like I really am excited about who is on our team and what they are doing and we have got some characters on the team for sure. Brett: We do, we do. Actually, we should put that in the notes of like a future episode should just be like interviewing people from our team because when you have got characters like Gary and Tyler, they are just, I mean, yes. Brett: Yes. We definitely got some personalities. We have some high D personalities. Have you guys have ever ever taken the DISC test? The high D is kind of a dominating personality and then there is the I, S, and C. It is like the detail oriented where if you forget a period, they flip out. We have that type of personality. We have the super laid back personality which is like me I think, kind of. Brian: That is definitely you. Brett: I internalize it though. I internalize my stress. Nobody knows I am stressed but like I am ready to burst from the insides out. But man, you are doing an amazing job. Thank you so much for just doing everything. You are on the ball, you are on top of it. My biggest concern, if you guys are out there leading a team, I do not know if you feel the same way but my biggest concern is that my team members are happy, that they enjoy what they are doing, that they are excited to come to work, and that is really one of my biggest concerns. That is why probably I am always asking are you okay. I actually asked Chrissy who is our brand new acquisitions/dispositions assistant and last Friday I went to her and I said what level is your joy with this position? Like what is your joy level at? She is like I am doing good. She did not tell me a number but she is said I am doing good. Anyway, I am always concerned about that. Brian: That is good. I like the fact that you are like that as a boss and as an owner of this company so thank God. I think when you ask us that, you do genuinely care about that for your employees and for our team mates or team members. I think in turn we kind of put that on our clients as well. Whether you are buying from us or selling to us or anything like that, I think we are generally concerned about that you are. We want you to be successful, we want you to have this opportunity, whatever opportunity you need we want to bring that to you. I think that kind of comes from you imparting that into us. It is good, thank you for that. Brett: Yes, no, definitely. With that, if you guys want to get to know Brian more, ask him some questions, he is kind of the new kid on the block here at Simple Wholesaling. He has been with us for five or six months now but just e-mail him at brian@simplewholesaling.com. That was going to be in the show notes at Simple Wholesaling.com/episode100. He is our dispositions manager so he is selling our properties to buyers all over the nation, all over the world. If you are local interested in Indianapolis, if you are not local and you live in California or Florida or wherever, you are interested in Indianapolis or if you live in Israel or Egypt, I do not know. Brian: We do have a couple international buyers. Brett: Feel free to reach out to Brian. We would love to work with you. Now, simple tips and tricks that make real estate investing easier, faster and better. Brett’s Insight of the Week. Brian: Alright. This week for the Insight of the Week, Brett I got a good question for you. I know that we work with a lot of new wholesalers, people that are looking to get into this industry and people want to do what we do but one of the things they struggle with is being able to find money. Brian: My question for you is if you are starting off and you are beginning to wholesale, how do you find hard money lenders to help you out with that? Brett: Let me just kind of back up a little bit and start of kind of defining wholesaling because what we do in the industry is we buy the house and then we sell the house. We take the house down. Some wholesalers they might say well I do not need a hard money lender because I am going to assign the contract but let us just say you are like and eventually I would encourage you guys whether you are starting out or maybe a few years down the road that you do want to be able to take down and buy your own houses, right? Brian: This has actually worked too for somebody want or maybe they are new to flipping and rehabbing, are even new to running and they want to get into the game. I guess like looking for hard money lenders for them as well. Brett: Yes, definitely. This is just kind of something that I have developed and just through the years. If I was just starting out, I would start talking to your relatives or your family or your friends. It is funny, I just had this conversation today. This is actually, maybe I will not say the name, but it was somebody that I know that I have not talked to in a really really long time. They knew that we are in real estate, they happen to live in California. Once you live in California you know that the prices of homes have risen a lot in the last few years. Well, they are asking me if they should sell their house and then maybe what they should sell it for and then if they do so for that price they are going to have a chunk of money and they do not know what to do with it. It is going to be $60,000 to $70,000, something like that, after it is all said and done. What I would say is I talk to a lot of people like that. I said one of the option is you can loan it to us or a company like us and it is secured by real estate and you can make anywhere from 10% up to maybe 20% interest and that is very enticing to a lot of people. They do not want to do anything, they do not want to rent a house, they do not want to go out and flip houses like we do. They do not want to do any of that but if they want to make a passive return on their money, making an extra 10% to 20% interest on their money is actually really good. I will start with family, friends, my dad. He has loaned us money, I have a lot of friends that have loaned us money and just kind of see if the stock market working out for them, are they scared about the stock market? Mutual funds, they can put in a CD and make 2% interest, I do not know what it is. Or if they would like to make 10% or 20%, that is where I would start. But as you start to build traction and you build some success, I believe that if you start to build a brand and you are successful at flipping or at wholesaling, keep that in mind. Build just a portfolio or a program of showing people here is what I have done, are you interested? Because it is a win-win and people that see that you are successful, they actually find you. I have literally had two calls just in the last couple of weeks. People that say, ‘Hey, I have an extra $50,000 lying around.’ Because they hear about us, they listen to our podcast, they trust us and they ask me have you ever forfeited on a loan. I will say no, I mean, and I do not plan to. Then that builds a trust. The more you are successful, the money just kind of follows you eventually. Brian: I think a big part of that is just do not be afraid to talk about what you want to do. Like what you need and what you want to be doing, just share that with people. Just put it out there and do not be afraid of talk about that. Brett: Yes. Especially like guys like me in some of the, I mean I am not saying I am old, but I am getting 38, getting up there. Brian: You are older than me. Brett: Yes. But I have some friends that are entrepreneurs. They are 50 years old, 60 years old, but even guys like my age we would love to see young, hungry entrepreneurs come out and be successful so if I was sitting down with a hungry individual entrepreneur that had a great idea, I would love to try to help them in one way. Maybe is to invest in them or their business and people really want to do things like that and I think that is awesome. Do not be afraid to approach people like that because they really do want to help. They have been successful throughout their life, they have a lot of money sent over here, and what better way for them the use their money than to help a young entrepreneur be successful as well. Do you dream of a life that is purpose driven and makes a difference, Spiritual Foundations. Brett: In today’s Spiritual Foundations, we are going to go to Mark 9:35. ‘Sitting down, Jesus called the twelve and he said if anyone wants to be first, he must be the very last and the servant of all.’ I love this verse and I love Jesus’ teachings because he turns our culture and everything that our culture teaches up on its head. Because in our society and probably forever, people have wanted to promote themselves. They wanted to rise to the top, have the most power and be a master of all and not to be a servant. Not to serve others but just to have servants surrounding them when you think about kings or really wealthy people, rich people, people that have a lot of power you see them with the servants, right? They have butlers, they got maids, and people just serving them hand and foot all the time. Jesus kind of turns that around and he says if anyone wants to be first, he must be the very last and the servant of all. To me, that truly means that you have to have a servant’s heart and if you truly have that humble servant’s heart and you put others before yourself most in all of the time, then you will be exalted. You will be raised. I mean look at Jesus’ life in of itself. He came down as a humble child, he grew up being poor, he did not have anything. He called disciples to him that basically were nobody or fishermen and just trades men and he literally took his own life and died a horrible death on a cross like a criminal’s death that other criminals are suffering for you, right? He was the ultimate servant giving up his own life for us. He has called us to do that so maybe you do not have to do that because Jesus has already done that for you but each and every day whether you are sitting down with a client, your family, a friend, or whoever it is in your mind put them before you. Jesus says that if you continuously do that, you will be exalted and maybe he is talking about in eternity. Maybe you will be getting rewards and eternity. Maybe you will not even see a reward in this life. I believe that it is very rewarding when I put other people before myself but I am sure that there is eternal and scripture it says there is eternal rewards as well. What do you think, Brian? I mean what this mean to you and when he read this especially in this industry when we are all trying to promote our own faces all the time? Brian: I think definitely the word that jumps out with this scripture is just humility. You have to be humble, you have to be able to not put yourself first in everything we are doing. With this industry, I think it is this huge that you are able to realize that do not act like you are above everybody else that you are working with. We kind of talked about earlier that there is two different personalities that we have on our team. Since you are working with a ton of different personalities, just different types of people, but you have to be able to serve them. You need to make sure that they, whether it is your team, whether it is your clients, whether it is people that are selling you, make sure that they are getting what they want, make sure they are happy and kind of putting out there hey we want to help you. I think that is where we have been successful in that. Making sure we give people, hope they get what they want, but the same time that is not what our purpose is. That is who we want to be, that is who we are. The scripture right here, it just sums it up completely. Once you think that you are first, once you think you are at the top, that is when you get knocked down. But when you have that reality of just hey I am who I am and I am just going to do my best and even I am at the bottom and I need to work my way up or whatever. That is when you are at your best. Brett: Definitely. Just to kind of go with that, the more money that you make, the more successful that you are, the more power that you have, the more difficult it is to be humble because everybody is looking at you. For example, we have been able to create a decently successful business. We have this podcast, we have been asked to be a member and kind of help lead some of the CIREIA events, we have our own meet up, we have been asked to do a radio show, we have been asked to speak at some different things, we have been asked to do these things so people are looking at us and saying, ‘Wow, you guys are really successful and you are amazing and all this.’ The more that happens, the more difficult it is to be a servant or to be humble and I think that I always have to remind myself of this scripture each day that I need to be a servant. The reason why we have got to where we are at and we are successful is because we have tried to represent Jesus and serve people in a positive way. We cannot forget that. Sometimes I think I can never go back to cleaning the junk in the trash and the human crap out of houses. I could not do that but then I say you know what I am not above that. If I have to do that, I have to do that. I am never above a certain point, right? We have people in our business that do that and they love it and we pay them for it but if I have to do that then I have to go back and do what I have to do to serve whatever I am doing to serve my family. If I have to do that to put food on the table, I just have to do that. Never think that you are above a certain position or person or any of that. We are just here to have that servant’s heart and just kind of represent Jesus. We hope that guys enjoyed the Spiritual Foundations today. We do this to help you guys and to help us be a reminder to have a servant’s heart, to represent Christ in all that we do. Now, we are going to get on to the interview with Mr. Neal Bawa who is revolutionizing real estate with his knowledge and technology. It is going to blow your mind. Brett: Guys, we are super stoked for our guest today. We get a chance to sit down with the one and only Neal Bawa. If you have not heard of Neal, he is the president and COO of Financial Attunement which is a commercial real estate investment company that specializes in acquiring apartment complexes all across the US for over 200 investors. Neal is an accomplished single family and multifamily investor. He is actually just telling about one of his very first project where he helped developed a 27,000 sq ft building which he is going to definitely dive into that. He currently own single families, duplexes, triplexes, quadplexes and apartment buildings in California, Illinois. He is an active passive investor in multifamily commercial syndications with over 2000 units in eight different states. That is a mouthful, Neal, but welcome to the show. You a very accomplished. Thanks for being with us today. Neal: Thank you, Brett. Thanks for having me on the show. Brett: No problem. I am super excited. I know you get a chance to speak and do these things a lot but just kind of if somebody has not heard of you before, one of our audience members, let us dive in to your origin story. What did you do before you got into all these fancy complicated syndications in commercial real estate and take us into how you got into real estate? Neal: Sure, I am Indian in origin. Like a lot of Indians, I am a technologists, computer science degree. Came to Silicon Valley in the late 90’s and worked at a company, became a partner at that company. It was a technology college. Did not do the .com thing. We went from opening it in the late 90’s to selling it in 2013. It is a 15 year journey for that technology business and it was a very successful exit at the end of it. As I was doing that, that college had lots of different campuses. My first taste of real estate as a chief operations officer was to build out campuses, right? That is how I learned the real estate trade buying campuses. You were just talking about a building. It is 23,000 sq ft. It was a shell and it had to be built out into combination of offices, classrooms, and hallways and restrooms and all of those sorts of things and I never done that before. I jumped in and basically learned from architects and general contractors and learned by making mistakes and then I followed it up with the second campus which was 33,000 sq ft and I did not have the money to buy it. But I had to buy, I could not rent it, it was a shell building and I needed it ready in ten months. I came up with this crazy idea of condominiumizing offices, right? You hear about condominiumizing apartment buildings often and selling off pieces but offices can also be condominiumized and pretty much the same way. It is a much more complicated process. The idea was we buy this 33,000 sq ft building and on the day of closing, we sell a pieces of the buildings to other investors who then develop their pieces into offices and then as our college grows, our technology business grows, we would then go back in and rent those offices back from them with a long term goal of the entire building being rented by our business. That was done in about 2007 and it took about five years for us to take over all the suites back from those owners and now pretty much all of the thirty three thousand square feet is rented by the technology business. That is how I kind of got into real estate through my day job. I no longer have that day job. I exited after the sale of the business. That was in early 2013. But I was doing a lot of real estate since then. 2003 was the first campus, 2007 was the second campus and then between ’07 and ’14, built another four campuses. Not construction from scratch but taking over existing campuses and modifying them. That is where I learned a lot of the real estate skills. As far as single family and multi-family, I will go into that later but that is kind of my background. Tech guy, tech geek. Brett: That is quite a background and he said he had never done all the bathrooms and hallways. I mean why would you? Is not that just an everyday thing that people just do? Just developed. It is like I am going to skip buying those single family homes, I am going to just build a skyscraper in downtown Indi. That is pretty awesome man. It is definitely you learn I am sure a lot and that is pretty cool. I do not think I have ever heard of condominiums with office suites. That is pretty cool. Neal: Necessity is the mother of invention as they say. I have nine months and cohorts of students waiting to start and I did not have a building. All ended out well. Very happy about how that started. Brian: Very cool. I know you were kind of talking about how you are a tech geek and stuff like that, how are you able to use technology to help you with just all the real estate investing that you are doing. Well, I teach about three thousand students a year about the magic of multifamily, about real estate, and one of the things that I tell them is that if you have even the slightest amount of technical talent, you are in luck because you have an advantage in commercial real estate or in single family real estate over other people because real estate is the least technologically advanced vertical in the US. Used to be insurance that was a least advance but now they have become more advanced. In real estate there, is so much opportunity for people that are technologically advanced to jump ahead of people that are not because if you think about it, people have been buying real estate for over a thousand years, right? For rentals and for profit. A lot of real estate is about very rich fat cats, they are very old fashioned, these are very rich people. They are very smart. But they are very old fashioned and they are not really into using technology. You can disrupt real estate in your own little way at a single family level or a multifamily level so easily. I teach about 35 or 36 different applications, all of them web based, that can be used to disrupt real estate. Each of these applications can be the difference between you making no money and you are making 20% already. That is how powerful they are and what is amazing is how inexpensive they are. These are the sort of things that in the 80’s and 90’s gurus who charges $30 to learn one of these applications. Now, they are $19 a month. Having all these cloud services available that astonishing data and analytics allows you to make much better decisions but you really need to know what these apps are. Brett: I love that and I am right there with you. One of my gentleman when I first got into real estate and I rode around the car with him, he is not in the technology at all. He is a very wealthy man but I actually still see him. He still faxes the docs, he does not know how to use the e-mail and just things like that. I do believe that technology is changing everybody. I think I heard a gentleman say, ‘We do not have a choice whether technology is going to change our life or not, it is just going to happen. We really either have to ride with it one way or another.’ With that said, what are some of those applications that you are talking about can you kind of go in a little bit and without the high tech language but just you talking to little lady that does not know that much but can you give us a little taste of a few applications that has absolutely transformed the way you look at real estate, the way you buy real estate? Neal: Absolutely. I will give you a few different buckets first and then we can dive down kind of through each bucket. The first bucket that everyone should look at when you are looking at real estate is about where to buy, right? The where to buy bucket in my mind is especially for new investors, right? Folks that are in the first three to five years of their real estate investing career, full time or part time. That bucket is the most important because that is where people make the most number of mistakes. The where to buy bucket. If you do not have a folder on your computer, in your browser, that basically has a set of apps that help you buy real estate and buy in the right places at the right time then you are making a colossal mistake. An absolutely colossal mistake. In that bucket, there is free apps and there is paid apps, right? I use both of them. When I am teaching, the free app that I use the most is called City-Data.com. Now, most people know this app, right? OI will go into a room and I am teaching a hundred people and I ask them to raise your hands and how many if you used City-Data.com. I get 20, 30, sometimes 40 people raising their hands and they think that they know how to use the application but what they really know is well you can go to City-Data.com and you can see things like what is the income level of people. You can see how much single family homes are selling or you can see the rents, right? But not one of those people I have found shows me effectively how to use this free website. Because if you think about it, the website is not supposed to be used at a city level. You are not supposed to just type in something like Orlando, Florida into that website because Orlando has really great parts and really awful parts. There is places where in Florida, in Orlando, where you are not safe at night just walking in those places and then those places where the rent is going to be ten times higher, right? The way to use these applications like City-Data is to drill down. What city data allows you to do is to drill down to even an area that could be maybe 200 x 200 yards. That is how small it gets. Most people do not know that but all you have to do is take any city in the US, let us say Orlando, Florida, and it will come up and will give you all the rents and it will give you all of the income levels. But what you need to do is to figure out what is the minimum benchmark for income in that particular city or in that particular state? Students that come to my boot camp get minimum benchmark levels by city and that is a paid event. But here is some basics, right? You do not want to go into an area where the median household income that is at the top of that city data page is under 40K because those people will always be struggling to pay you rent. Whatever you think you are going to make in terms of your cap rate, you are not going to make because of excessive delinquents, because of legal costs, because of eviction. Do not go into an area where the overall median income is below 40K but you might see cities where the number is above 40K. Orlando might be 47 or 48 and you are like I am good not really. Scroll down on the page until you come to a map of Orlando and you will see lots of little tiles on that map. Click on each one of those tiles. They represent that small little neighborhood and make sure that the tile that you are buying in, that number is higher than 40K. Neal: That can make an enormous difference. That is a completely free tool on the same map. When you click on a tile, make sure that the unemployment rate for that tiny little is not more than 6% or 7% because of the unemployment rate is very high. Then again you are going to suffer from delinquency, eviction, high churn, and all of these other costs that are really the killer for profit, right? What kills profit is churn. Whether that churn is related to nonpayment or whether that churn is related to transitional tenants like Las Vegas has. Well it is going to kill your profits because everybody assumes that tenants are going to move once in two years, one is in 2 1/2 two and a half years. They are moving every twelve months because they cannot pay or they just want to leave for whatever reason. You are not going to make any money. Those kinds of benchmarks are what I use. City-Data, they are nine different benchmarks that I use in my boot camps and when I am teaching my boot camps, I hate PowerPoint, when I am teaching the boot camp, it is just demos, right? I am on that website and I pick favorite cities like Orlando or Columbus or Phoenix and I tell people look at these numbers. You look at these nine numbers. You see these ranges, these are the right ranges to invest in. Then I give them bad cities to look at like St. Louis or Cleveland or Detroit. When I show them those same numbers and you can see the drastic difference between the numbers. Brett: Is Indianapolis in your good list or it is on your bad list? Neal: Well, portions of Indianapolis are on the good list. Indi is one of those cities that is a block by block sit. Brett: You do know Indi, you know it very well. Neal: Thanks. The short answer is the portion of Indi that is closer to the educational facilities, the university, tends to be in more affluent areas. People that say I want to invest in Indi. The short answer is I want you to go into City-Data, scroll to the map right for Indi. Now, look at the portions of the map that are darker blue, not lighter blue. Invest in those places and you will be fine. If you invest in any of the light blue or very light blue areas, you are going to be investing in body armor, helmets. Brett: That is not the type of investing we want either. Neal: Right. That is the difference between the light blue and the dark blue in City-Data. It is completely free too. It is not about access to tools, it is about understanding what to do with it. Brett: That is so good. I actually do not even use that tool so I think that that is definitely something that we will be looking at in our business. Is there one other app that you might want to mention? Neal: Sure, yes. Again, as I said, I teach about 40 of them in different buckets but in the where to buy bucket specifically for apartments. The first one that I gave you works for single family and multi-family equally well but here is one that works really well for multi-family. Let us say you are looking to buy a duplex, quadflex, ten unit, whatever it is. You do not know which places you should buy in and hold it, right? This is for buy and hold people, not for buy and flip. There is a website, again, it is free. It is called weareapartments.org, weareapartments.org. This website shows you the projected demand and supply imbalance for apartments over the next thirteen years. If you want to get rich, you want to focus on imbalances that are long term. In the short term you can flip. Flipping is a very useful activity because it creates cash. Flipping does not make people rich unless they are on television. There are not really any very wealthy flippers because the problem with flipping is you are being paid for your time. The moment you stop flipping, you stop making money. When you get into a good areas which are buy and hold in appreciating markets, in markets with huge imbalances you become wealthy because if you get beyond the first two or three years which are always challenging for any multifamily project, then at that point the property stabilizes. It keeps giving you money for a very long time. I would go to this website and I would select Metro’s, Indianapolis, select a metro. Then go down to the chart that shows you the supply and the demand. Obviously, you want that gap to be the highest. As it happens, the gap in the US is actually not in the continental US, it is in Honolulu. Because Honolulu at this point has no land left. You will notice that for the chart for Honolulu, the supply is just a line at the bottom and then there is this demand that is just growing. I do not know how Honolulu is going to deal with this housing problems. I have tried to get into that market knowing about the supply demand gap but there really was nothing available in the marketplace that made any sense. You basically had to buy something at zero cap today and then wait for the prices to go up which I was not willing to do but there are many other markets that have decent cap rates that have huge supply demand gaps. Orlando, Florida, Phoenix, Salt Lake City, this have huge gaps. But when you look at a city like Pittsburgh and there is no gap. Supply is higher than demand, right? Almost you are going to shoot yourself in the foot. Buying in a place like Pittsburgh where supply is significantly greater in demand. It will take a long time for set up to get absorbed. I know Pittsburgh is doing some very interesting things with self-driving vehicles and Carnegie Mellon University but they also have 250,000 empty houses. It takes a very long time to fill those up, right? Those are the sort of things that can really help you make the right decision when it comes to the first bucket, where to buy. Brett: That is awesome, yes. My mind is getting blown just right now with these apps and you just mentioned a couple of them. I know that this is just whether you are buying single family or this new website about apartments, yes, this could really just change the game guys. If you guys are interested in these couple of apps and then if you want to give us any more after the show that are free, that are paid. Neal, we would love to hear them, we love to put them in our show notes at simplewholesaling.com/episode100. Brian: Neal, you invest in like eight different states. How much time do you put in yourself for just researching and using these apps and just all the data points you need to find to know what states you want to invest in? Neal: I think that research is really part of our DNA now, right? Initially, at the beginning of the year I create a presentation called real estate trends, in this case, real estate trends 2018. That takes me about a hundred hours of research and there is about thirty vendors whose data is in there. Some of them you have heard of, Trully and Zillow and Realtor.com, but some you may not have heard of. People like CoStar, Axiometrics and beasts Reese, which are basically people that sell data for a living. I gathered the data from those thirty sources and I looked for commonalities because Zillow is very tight to their methodology which may work one year and may not work next year. So as Trully and so is Realtor.com. But when I look at commonalities between, if I see a city like Reno and it comes up in the top three in every [inaudible][38:43] list whether it is single family or multifamily. Sorry, every one of those lists it comes up again and again and again. Well then, there is the reason for that. That area has both momentum and it has fundamentals. Underlying fundamentals that make it strong. I am looking for those sorts of areas. Once I have done that for the year, I make up my mind and I say I am going to invest in Utah or I am going to invest in Boise, Idaho or in Reno, Nevada or something like that, right? Once I make up my mind, when I reach out to brokers and I get properties from them, that is where I apply all of these tools because I want to make sure that not only am I going into a great city, I am going into a good neighborhood. Am I going to a great neighborhood? No. Actually, I do not have any properties in great neighborhoods because great neighborhoods are three cap or four cap markets. I am looking to make cash flow for my properties, for my investors, so I am really looking for good neighborhoods, above average neighborhoods and that is what all these tools that allow me to do to figure out, to drill down, and figure out if this is the right neighborhood to buy in and whether the rents and the sales comps in that area really match up to what I would do. Brett: Man, sounds good. It is just so much information and you sound like just your research and all of this is absolutely phenomenal. Some of our listeners might not be that tech savvy and what not. A lot of them investing in single family homes. What are some things that you do in your business because it sounds like you are very process oriented, you are very system oriented, and you do a lot. I mean you are trying to find a commonality between thirty different websites or forty different apps. There is not a lot to go over. A man like yourself, how do you get all of this done and where do you start at building out these processes I guess? Can you kind of go into that and how you are able to do all this and research all this? Neal: Sure. Obviously, you need a lot of time to do these sorts of things, right? The thirty websites that I mentioned, I do that in January. By Feb, I know exactly where I am going. But if want to scale, right? If you want to be able to do a lot of different things, you have got to sit down, lock yourself in the room and create process. The creation of process, if you have not done it before, it is not as easy but I can tell you once you do it a few times, you get better at it and you get addicted to it. I use a lot of virtual assistants. These are people that live in the Philippines and India, they work nights so they work my day time. I give them phones to ring central and I give them e-mail access to my company and I give them e-mail access to my inbox. These virtual assistants, there is seventeen of them, actually twelve right now that are active but seventeen In total. These folks carry out a very large percentage of the steps and once I get comfortable with them, once they have been my employee for three months, four months, five months, those people then represent me. Thousands of e-mails are being sent from me, written by me as templates and processes that are being sent out by these people. I even template the responses because I know what the typical responses from people are. Build processes that allow other people to take other parts of your job leaving you free to think. A lot of people simply do not give themselves time to think because they are so busy doing it. From time to time, once a week, basically look back at your week and say what were the high value parts of my week and what were the low value parts and how can I automate the low value parts by bringing in folks like virtual assistants or by using technology instead of doing everything in a manual fashion. I tend to do that a lot and, again, it is something that I teach in my boot camp. I teach a separate hour about how do you get the high value tasks from low value tasks. One other piece on your question, right, you asked me this question on will I have time to do this research, what about folks that do not have time? Well, I will give you a tip and this tip it will take you two or three hours to figure out a lot of really good places to buy it, right? Every year in January, most vendors publish top ten lists, top five, top ten, top fifteen, these kinds of lists. All you have to do is lock yourself average of two hours in a day, once in a year, and start searching for top ten cities that… Top ten cities for single family, top ten cities for multi-family, top ten cities for rentals, and top ten zip codes, then top ten states. Between states, cities, and zip codes and between single family, multi-family, and rentals. That is nine data sets that you can get to within two hours. Just look for the commonalities and those are the best places to invest in. It does not really matter whether you are flipping or not. I would say that there is a slight difference if you are wholesale and if you are flipping. Then go with cities that appear to have price growth momentum. Do not focus too much on rent growth because rent growth is not tied to emotion. Price growth is tied to emotion. That is why California has been a great market for flippers because prices grow here. When you see a lot of price growth momentum in a market where the reviewers on the web are saying things like there is no inventory in the market place. Homes get picked up within days. Those are terms that you are looking for if you are wholesalers or flippers because there is a lot of emotional investors in those markets and that goes towards you when you are flipping those kinds of properties. Two hours, no more, you will get a huge amount of information from the web and you will not be paying anything to it. Brian: I am ready to sign up for this guy’s class right now. I could sit here and listen to him all day. This is fantastic. It is such good information. I know you are on your data points and you are looking at all this stuff and you are having your VAs help you out with all this stuff, what are some things that maybe you can forecast coming for 2018 real estate investing? Neal: Well, both good and bad, right? On the good side, both the US economy and the world economy are recovering, right? In the past, if you wanted to know what was going to happen at real estate, you would start with the US economy, right? You will look at your local economy, maybe your state economy, and you will look at your country’s economy. Unfortunately, that does not work anymore. That is because we are in an environment where our economy is very strongly affected by what happens outside. In the last two or three years, the US economy has been doing well but it has been held back by a lack of growth in the Euro zone, Japan, and to some extent in Asia except for China and India. That is changing now. In 2018, every single economic body that I know off is raising their forecast of growth. Whether that has to do with Mr. Trump’s tax plan or not, I do not know. All I know is the net effect is that growth is accelerating, right? That is good news. Because when growth is accelerating at the beginning of a year, the chances of a recession in that year are practically zero historically. If people are thinking real estate is going to crash, the stock market is going to crash, the economy is going to go into a tailspin, I do not see that happening unless we get a black swan event like 9/11. That is the good news, you are going to be in a good environment for the next 12 months and possibly longer because of a worldwide recovery that is happening. This is the real recovery that is happening now since after 2008. One of the reasons why I called this recovery real is because actual inflation is happening. The last five six years, we have said we are recovering, we are recovering, but where is the inflation? In a recovery, there should be inflation. This year we are finally beginning to see inflation in wages and it is not just a US phenomenon, it is happening in other countries as well. We are going to get a good price appreciation this year and that is the good story, that the good news for the year. Here is the bad news, I think most of you know this but be wary about this. If prices go up and at the same time interest rates go up, margins go down. Because margins are dependent on price of properties and interest rates. Well, unfortunately both are moving in the wrong direction. Now, if you are a wholesaler or a quick flipper, this is not bother you, right? If you are one of those flippers that is doing a flip that takes 18 months, you should be very worried because there is three or maybe four interest rate hikes coming in 2018, followed by two interest rate hikes coming in 2019. If you are doing a project right now and interest rates are going to be one and a half percent higher 18 months from now and your project is selling, you are going to have some cap rate issues. You are going to sell at a cap rate that is higher than the cap rate that you are buying today. Short flips are perfect, right? Wholesaling, not affected at all. But I think long term buy and hold people, if you are not locking in the loan today, if you are going in for a bridge loan two years out, be very careful. You are going to get burned. Brett: Wow. Neal, for some reason, when I am hearing you talk about this year because this has been just a topic in my mastermind group and everybody is talking about the real estate markets going up, is there a recession coming or is there a crash coming and all this but when you are talking about this in the year 2018, I really trust you. I am going with that you are saying just buy all the research you are doing. Brian: At least I am very convicted. Brian: I am not going to do this. Brett: Yes. Some awesome evidence backing that up. Brian: Audience, you heard it here first. We are going to be fine this year. Brett: Keep going, keep going. Hey, just real quick, before we go to the next section of this show, one question that I have is you talked about virtual assistants which I am a huge fan of using virtual assistants. I am a huge fan of delegating, huge fan of the four hour work week. Not saying I only want to work four hours but just kind of having that mentality of sticking to the high level tasks for myself. I was just telling Brian before the show that why did I do this? Why did I not just delegate that out and all these different tasks but you have, what did you say, how many virtual assistants? Is it 12 or 15 or 17? But my question with that is how do you manage all of that? Because whenever you hire somebody on and you delegate something else and you develop a process or a system like is it very difficult to manage all those people? To keep them active, to keep them on task, to do all that, do you have a certain process to keep them active I guess is my thing? Neal: I will give you two ideas on that that will help, right? One that will work even when you have a single virtual assistant, one that is really designed for when you start to scale and start getting multiple virtual assistants. You got a single virtual assistant and you want to give him a very detailed instructions but you are being lazy because this detail instructions mean you have to take screenshots of your computer and then you have to go write pages and pages and pages and pages worth of stuff and you do not really want to spend that much amount of time doing things. Well, do not, right? My way of giving people instructions is a software called Snagit, right? It is a [inaudible][50:29]software. You can install it on your computer or your Mac, I think it cost $30. What I like to do is when I am giving people instructions, I want to be very specific. I want to be crazy specific, right? What I do is I turn on the Snagit video, it is now recording my voice using a microphone just like we are talking now and it is recording my screen. Then I start giving people instructions and when I am giving them instructions I tell them what they need to be doing, I tell them what the exact result is going to be. As much as possible, I show it to them and then I always finish by saying ‘Add a tab to your tracker.’ All of my virtual assistants have Google Trackers and every single project is a tab in the tracker. I never allow any of my assistants to work on projects without having tabs in the tracker. That forces them to ask me questions when they do not understand because very often they do not understand. The other pieces because the Snagit video, right? as I am going through the video, I am thinking about what are all the questions that this person could ask and I am trying to answer every single one of those questions both by showing things on the screen and by saying and giving them examples on the screen. But this process is so much faster because I am not taking screenshots. It is just a video of my screen, I am just thinking out loud and saying these are all the things that I want to do. You will find that you will get very good very quickly because when you are in video mode, with a very show and tell mode, we actually tend not to have to think a lot about what you need to do. Obviously, you will get better at it over time. But in five to ten minutes, I can give instructions that would have taken two to three hours to write. You know what is nice about Snagit is even though it is software installed in your computer, you have access to Techsmith.com for free. When I finish the video, I click the Techsmith share button and it gives me a URL in about two or three minutes. It has uploaded the video there and it gives me a URL. I give that to the virtual assistant and they put it at the top of their tracker tab. Now, in the future, if I lose that virtual assistant, guess what I am going to tell the new person? Go to the top of that tab and watch that video. Then everything that the previous virtual assistant has done is in the same tab. They are learning from the video and they are learning from what the person has done in the same tab and now I am much further ahead and I do not have to restart with a new assistant because that is one of the problems right? When you lose one of these people, you feel very handicapped because you have taught him everything and now that person is gone. But by following this two step process and using Snagit to take short videos of things that I want my virtual assistants to do, I am way ahead. Now, in my case, I add another layer to the. What I have done is for my 12 active virtual assistants, I actually have one of them as a manager on top of the others. Her job is to make sure that everything that I am teaching these virtual assistants, she is enforcing that. There is enforcement of those things and so she is my most intelligent virtual assistant and I copy her on every instruction that I send to each VA. She watches those videos and she is watching the virtual assistant and making sure that they are doing it right. She is their first resource. They are not supposed to come to me and ask questions. They are supposed to go to her and ask questions. Because she is the most intelligent of them all, when she comes and asks me that question, I give her the answer. She is just about as good as me in giving those answers out to the other eleven VA. Now, I do not have to answer eleven or twelve people. I have to answer one person. Building a higher level VA is important You have to pay them well so my high level VA is paid so well that she really cannot go anywhere. But for me, if I pay her double market rate and market rate is $5 an hour and I am paying her $10 an hour, she is 90% as good as me. My time’s worth is $200 or $300 now. To me, it makes all the sense in the world to pay somebody $10 an hour and be 90% of me. What I can tell you is, and I have proven this to my students by showing them demos in the boot camp, there are not 24 hours in a day. If you have virtual assistants and technology at your back and call, there are actually 240 hours in a day. Brett: I love that. I love the managing of the virtual systems too because I have a virtual assistant named Roxanne. She is an absolute rockstar. We only have one but sometimes it seems like every time we have had to hire a new one on, I do not know, it is just something, I do not know. Maybe it is the language barrier and I think that also gets to it too is that they can also communicate a lot better with all the rest of the virtual assistants as well and that is cool, that is awesome. Thanks, Neal. We are about to go into the section of the show that we like to call in Going Deep. Brett: In this section Neal, we just ask some more questions about you and in your life. I know that one of your passion is teaching and training. I can just tell by that and I know that you speak at events and you hold trainings. What does it do to you and why is it so important for you to teach what you are doing to other people and to watch your students be successful? Neal: It is more gratifying than me doing stuff myself because I believe in the law of abundance, right? I am a very spiritual person and I believe that abundance only happens if you share it. I can do things by myself but that is one person and my effect in the world is tiny. But if I teach three thousand people a year and out of them even thirty go out and do something, I think that that gets counted overall in my ledger and that is what I believe. To me, teaching actually is more fruitful in the long run from a spiritual perspective than doing now. My project manager right now is a brilliant young girl. Her name is Lian Feng. She is a MIT graduate who worked for Apple and her family has some money and she was looking to invest it so she came to one of my boot camps and took it in San Jose. Then she came over to me and said I really love the way you do things. I want to work with you and with your company. I said, ‘Lian, at the moment, I do not have a slot. The only thing I can think of is I am trying to organize my project management software and migrate from a low end software like Basecamp to a high end one like Asana.’ She said, ‘I know how to do that. Let me do it. I will jump in. Do not pay me a salary, let me show you my value.’ She showed me that value very quickly and now she is a paid project manager and a partner in my company and that is the kind of success that I want to have. Somebody goes from being a student to a partner because I was able to create some a-ha moment with her. Many of my students I do not hear from them. They come to a boot camp, they take the boot camp but then 13 months later I get an email from them saying I bought this property and I did this and it was exactly as you said and it just lights up my day. It is bigger and better than just making money. I think you have to be spiritually satisfied with what you are doing otherwise I do not think you can achieve your goal or mission in life. Brett: Love that, love that. Love your heart, Neal. We share the same values. I love teaching, I love watching other people be successful and love the story with your student now becoming a partner in your company. That is amazing man and I just appreciate you just being on our podcast today and sharing everything. I mean you are sharing gold nuggets. I always tell at our events or if I am talking to one of the team members, it is not about the big things. I think it is just those small things. Like those small things that I have done, those small tweaks, that small app that I bought absolutely changed everything. If you are listening out there right now, just know that it is not the big things. It is those small everyday things, those little tweaks you can do in your life or your business that is going to change the game for you guys. It is time for a Touch of Randomness. Brian: We are going to… We are running out of time on here a little bit so we are going to wind down. Neal, at the end of the show, we like to just kind of do a little lighter side. I want to learn a little bit more about you with this touch of randomness questions here. Our first one here is do you follow any sports or particular athletes or anything? Neal: Well, tennis and cricket. In India, cricket is the big game. Though I follow most American sports, the passion is really for cricket and my kids who of course, they were born in the US so they like football, but they are also fanatic cricket fans. We enjoy cricket a great deal. I have left India behind for most things but cricket is not something that I could shrug off. Very often, because of the 12 hour difference, I am up at one in the morning watching games. If I am talking with you and I sound like a zombie, that is probably why. Brian: Is there a particular cricket club or team that you root for? Just the Indian sports team. The club level cricket leagues has just been formed a few years ago so I support the city that I originally came from, Mumbai, in kind of club level cricket. But national level cricket is still kind of where my heart is and it is nice to have that passion. Then the other passion is not quite a sport but I love playing online games like Civilization or Sim City because Sim City appeals to me because I am building an entire city. You see what I mean? Ties in to what I do with real estate. It is deeply satisfying to play Sim City online against other players. Brett: I could see you enjoying that, Neal. I can see that a lot. Last random question. When you were a child, what was your dream profession? Neal: It was certainly being an astronaut. Some of those flashbacks I had recently. I read a book called The Martian which was turned into a big blockbuster movie and I got flashbacks to being an astronaut. But I have to tell you I am 45 years old at this point of time, I have realized that as children we focus on those things that we feel would make us fulfilled. I think that every job is fulfilling. It is really about how you do it. I think I would be a really happy fireman. I think I would be a really happy entrepreneur in some other field, maybe not real estate. Obviously I dealt with the education field they enjoyed it. I think it is all about constantly challenging yourself in the job and having that innate satisfaction. I did not end up an astronaut but I am not sure I would be any happier if I was an astronaut. Brett: That is true. I love that, I love that. Thank you so much, Neal, for just visiting with us today. Like I said, if you guys have not listened to this whole interview, you need to go back and listen to everything right now because there is so many amazing nuggets that Neal has given us today. Neal, if someone wants to reach out to you, where is the best place for them to go? Neal: multifamilyu.com, with the letter U, www.multifamilyu.com. That is where all of my free webinars are stored, the real estate trends webinar, multifamily fundamentals, my comparisons of various cities. There is a huge amount of information stored there so that is the best place to start. My phone number, my email is also there. Brett: Great. Well, you guys can go right now to the show knows which is at simplewholesaling.com/episode100. This is a wrap guys. We are with Neal Bawa in apartment investing across the United States. Thank you so much, Neal and we wish you the best. Neal: Thanks so much. Bye guys.